Last week, after a lovely night out, my daughter and I came upon a busker in Brighton's Lanes. It was quite late, very cold, and a young man was sitting on a pile of blankets, bundled up in a heavy coat. He was also playing a guitar and singing an old Van Morrison song, "Crazy Love." He had a wonderful voice--the kind that forces you to stop and listen, no matter how cold it is or how tired you are, and stay until the end of the song, even if it means missing the last bus. There was no other audience for him--the Lanes were empty--so I did what seemed appropriate at the time. While my daughter dropped a few pounds into his guitar case, I dropped in some harmonies. Yes, I'm a sometimes singer, and the writing "break" I blogged about a few months ago happily re-kindled my desire to sing and perform. Once I started writing again, I stopped, though--seems I can only exercise one type of "voice" at a time. Well, the late night, back alley singing felt good. I think it probably sounded OK, too, but mostly it felt good (at least to me!). 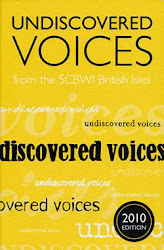 Re-wind to a few weeks earlier, when I was at the launch for SCBWI's Undiscovered Voices 2014. It was a great chance to meet up with fellow UV winners, all of whom are now friends, and to meet other writers and illustrators, who hope to be chosen for the next edition of Undiscovered Voices. The selection panels were there, too--editors and agents (including my wonderful agent, Sallyanne Sweeney) giving helpful information about what makes a good book, and what they hoped to find in a writer's (or illustrator's) work. For the writing panel, it all came down to one word--voice. They talked about other things--personal preferences in genre, types of books they didn't particularly want to read--but really, the only thing that truly mattered to them was voice. As writers, we hear this time and time again. But what is a writer's "voice"? How do you know if you have one? If you don't have one, what can you do? 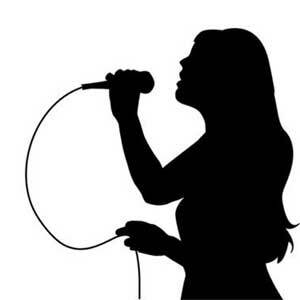 For me, my writer's voice comes from the same place that my singing voice does--the inside. Harmonising with the guy in the Lanes reminded me of how singing "feels", as much as how it sounds. It reminded me where my brain has to go, what my body has to do, and helped me remember the magical, strangely intimate thing that happens when two or more voices "connect". Singing requires a kind of suspension of self, where your body and the words and the music create something that comes from you, but isn't you...yet is. I think the writer's voice is similar. There's a stillness that has to occur, a concentration, an internalisation, a connection to be made if the voice is to resonate. But who or what is a writer connecting to? The imagined reader? An editor? The first connection I usually make is to character (although "character" could mean story, or genre, or setting, I suppose...) Writing feels to me like putting on a new skin, and working from the inside out, in the way that singing is also putting on the "skin" of both songwriter and the interpretative you-that-is-not-you. It's also like the way an actor "gets into character". For a YA or children's writer, this means channeling, usually, a child or teenager's point of view. And here, the actor analogy comes into play even further. To create a role, an actor has to examine herself--often going into deep memory--but must also be a keen observer of the world around her, taking note of how real people talk, walk, think. To have a voice that is true, a children's writer should have a long memory, not just for incidents or experiences or details, but for emotional situations that were awkward or painful or funny or terrifying. Like other artists, writers have to use their own lives and experiences, but then shake off the the shackles and limitations of self so that something else can play out on the page. This "something else" doesn't happen all the time--it takes hard work, perseverance plenty of practice. But to me, this is the "connection" that makes characters and stories seem true and alive, and makes the elusive writer's "voice" take off and sing. What a very interesting post! I like the comparison of the writing/artistic voice to the singing voice. I used to sing as well, and stopped when I started to get busy with illustration. "creating something that isn't you... yet is." That is such a true statement! I'm going to be after you for a song from now on. This is a lovely post - and in At Yellow Lake, I can confirm that the voice rang true. What a lovely post, Jane - so insightful. And I love how you compare the writer's voice to the singer's voice - there's a resonance there. 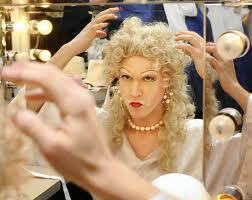 I think acting is much simpler than people make it out to be. Something too simple to analyze. Even Stanislavsky, with his "magic IF" was overanalyzing it. The truly talented and gifted actors simply play 'make believe'. And they're good at it. Those who aren't so good at it need teachers, coaches, books. Some people are born to be what they must be. If they find it, it works. If they don't..... There are great actors, singers, authors, artists out there who never get discovered, but that doesn't make them any less great. Many have never had a class, never read a book. They just are. Great article Jane!